Learn how to check brake fluid level and where the brake fluid level should be for your car with advice from a real mechanic. Checking brake fluid level in a car is something that every vehicle owner needs to learn. The braking system is your car's MOST important safety feature. To keep it in good working condition, you have to perform periodic maintenance which includes: checking the brake fluid level, adding brake fluid, replacing brake pads and rotors (if they're worn out). The first thing you need to do is to drive your vehicle around the block or start it and back it up then go forward and step on the brakes several times. This will ensure that the braking system is filled and that you will get an accurate reading on the brake fluid reservoir. Then find a level surface to park your vehicle on. Just like when you are checking engine oil you need to be on a flat surface in order to get the correct reading when you are checking the fluid. After you find a good flat surface then pop the hood of your car or truck. Open the hood an locate the brake fluid reservoir. Most of the time it will be located on the drivers side on the firewall. In some older vehicles you will be looking for a metal housing with several metal tubes coming out of it. This is the brake master cylinder. It will have a metal lid with a retainer to keep the lid from falling off. On this type of master cylinder there is usually not any full or low marks, you simply add fluid if it is not near the top. Where Should the Brake Fluid Level Be? This bottle will have markings on the outside and sometimes on the inside too. The top mark is the full mark and the bottom mark is the low mark. You can see what the current level of the brake fluid is because it will be darker than the white plastic bottle. Sometimes you need to clean it off to be able to get an accurate reading. 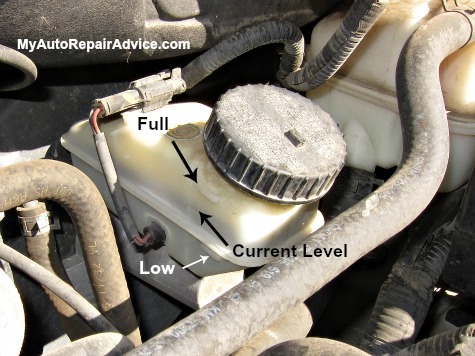 The fluid should be in between the two marks on the brake fluid reservoir (see photo above). If it is below the low mark then you need to add brake fluid. If it is above the full mark then you might have more serious problems. Brake fluid is hygroscopic. This simply means that it will absorb water if it is exposed to the atmosphere. If your brake fluid level is above the full mark then your brake fluid may have water in it. The problem with water being in the fluid is that water boils at a lower temperature than brake fluid and if there is a lot of water in it then when the brakes get really hot (like when you are going down a steep hill) the water could boil and cause a loss of braking. Another thing to remember when you are learning how to check brake fluid levels is that if it has been a long time since you have had your brake pads replaced, then the brake fluid might be a bit low because of that. As the brake pads wear the brake caliper pistons will be pushed further out of the caliper housing which will cause more fluid to be drawn into the system. This will cause the fluid to be at a lower level. When you change your brake pads, push the caliper piston back into the housing then the brake fluid will go back to a normal range. There are several things that you will want to do while you are checking your brake fluid. You should look for any leaks around the master cylinder area and you should inspect the brake fluid reservoir cap. If your brake fluid level is at the full mark then you likely don't have a leak, but if it is low then you might have a brake system leak that you need to track down. You should check the reservoir cap to see if it is leaking. Also, you should be sure that it is tight. If it is not tight enough then your brake system could be absorbing water. You should also check the color of your brake fluid. If it is really dark then you might have other problems. Now that you know how to check brake fluid you might want to learn how to add brake fluid. It's an easy thing to do, but there are a few things that everyone needs to know that will save you time and could save you a lot of money.